Kochava deduplicates users in perpetuity, other partners drop your data after 90 days. User engagement can be a challenging task. Users install an app and then go dormant for a number of reasons. For example, a travel app may serve its purpose and then not be launched until the next trip. While Kochava deduplicates users in perpetuity, other partners drop your data after 90 days, meaning you could be paying for the same user when they re-engage with the app after an extended period of time. When marketing to connected devices, the “marketing” details are often not entirely understood. There is so much that happens behind the scenes to facilitate accurate targeting and measuring of mobile campaigns. Too often a marketer doesn’t take the time to look under the hood and understand what factors are impacting marketing efforts. One of these key factors which is often overlooked is data retention. Data retention affects a marketer’s user acquisition, and their ad spend can balloon if device IDs are not deduplicated. When data isn’t retained in perpetuity, lapsed users returning to the app are counted as new ones, providing an inaccurate view of acquisition efforts and resulting in unnecessary payments to media publishers. Some measurement providers purge their records in as few as 90 days. When analyzing a user acquisition campaign, it’s important to consider returning users. Mobile users frequently install an app and then go dormant for an extended period of time. Others uninstall apps only to re-install again at a later date. Many apps are use-specific and users only install them to serve a temporary need. Travel and dating apps fall into this category where users may re-engage or re-install at a much later date to use a service again. For many analytics providers, a returning user who re-engages gets counted as a newly acquired one. The reason for this is data retention limitations. Many providers do not retain records for more than 90 days—any re-engagement beyond that looks new to them and is reattributed. If your measurement provider doesn’t have long-term deduplication capabilities, you’re likely paying for users multiple times over. The solution? 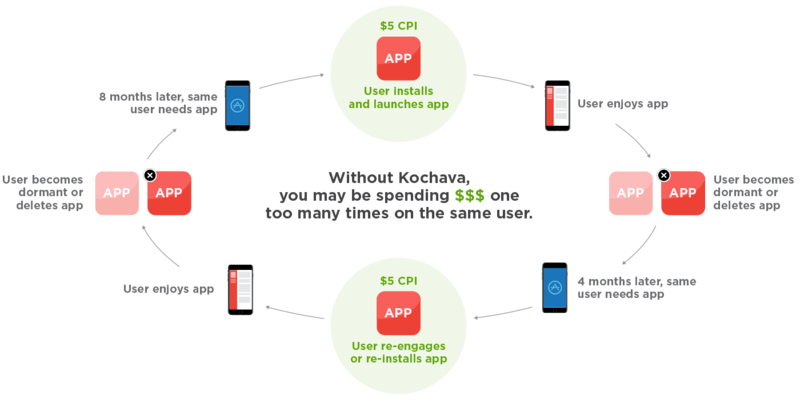 Kochava retains records in perpetuity and recognizes when dormant users return to the app or when users, who have deleted an app, re-install regardless of the timing. Your user acquisition with Kochava is a true representation of new installs, not returning ones, which make it easier to track ad spend. Among Kochava customers, we’ve seen that 6% to 12% of installs are returning users re-installing an app beyond 90 days. Paying for those returning users adds up on a CPI campaign. Note: SANS (Self-Attributing Networks) like Facebook and Google enforce different retention policies on the advertising ecosystem; Kochava complies with those policies. Let’s do some simple math to illustrate the issue more clearly. A gaming app, using a measurement provider that only maintains data for 90 days, has 100K attributed installs over the course of a campaign. If 9% are re-installs, that’s 9,000 installs reattributed because of returning users. At $2/install, you’re paying $18K. At $5/install, not having deduplication costs you $45,000! When Kochava systems receive an install, we store that row-level device ID. That’s how we recognize a re-install or dormant user re-engaging. If you’re a Kochava customer, our system does this automatically for you, so it’s one less thing to worry about as a UA manager. If you’re not already using Kochava, stop and ask yourself how many times you may be paying for the same user.